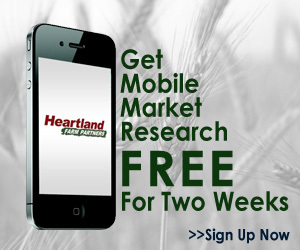 You are here: Home › Cover Crop Benefits › Manure management › Cover Crops in Minnesota › Cover Crops in the Northland › Cover Crop Challenges › Prevented planting › Timing of Planting › Cover Crops to the Rescue! 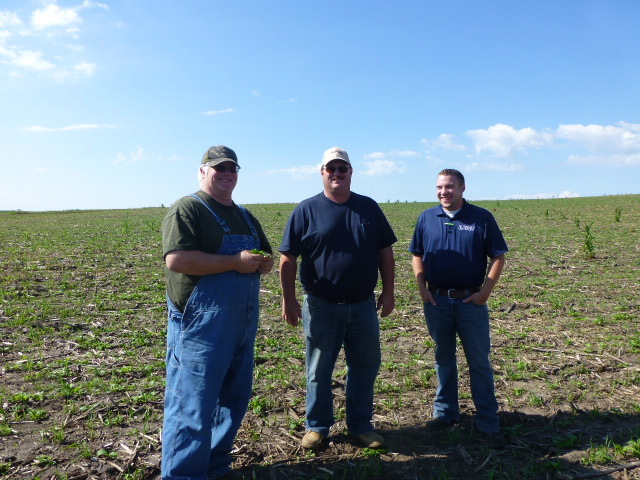 Brad, TJ, and Andrew inspecting one of Brads many cover crop fields that were planted in July 2013 on prevented planting acres. 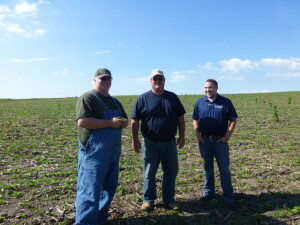 Recently I was in Minnesota with Brad Hagen, T.J. Kartes, and Andrew Heath looking at Brad’s 1,000+ acres or cover crops. 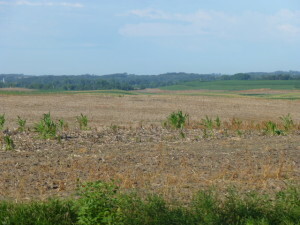 Brad had not intended on planting any of theses acres to cover crops in July, 2013…his intentions were to plant them in August or early September. But spring 2013 rains and floods kept Brad from planting corn or soybeans on most of his 1,700 acres near Ellendale, MN (about an hour SW of Rochester, MN ). Brad attended a cover crop meeting TJ set up for me to speak at on behalf of Legacy Seeds last March and as I spoke I could see Brad’s mind working. When the spring rains came so did phone calls from Brad to TJ and from TJ to Andrew or me (or both)…”what can I do to build soil during this disaster?” was the theme of the weekly (if not daily) phone conversations. 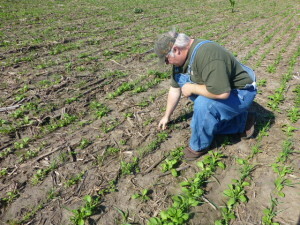 Brad’s goals are to build soil and to scavenge nitrogen from his hog operation and build nitrogen with legumes. Realizing that we would plant in early-mid July and not in mid-late August we all understood that we did not want to have to mow to remove seed heads if at all possible – so we left Radishes out of the mix. We also realized that we wanted to use a “summer” clover, so we used Berseem Clover for it’s excellent growth and N producing ability. We chose Oats as the grass in most fields and then we added a twist, Pasja or Vivant Hybrid Brassica. I have worked with Pasja for over 10 years and rarely ever saw it produce a seed head in the summer or fall. While Pasja (nor Vivant) have a big tuber like a Radish they do have the ability to scavenge a tremendous amount of nitrogen and earthworms dwell around their roots. Brad Hagen looking at his Pasja Hybrid Brassica and Berseem clover. These are brand new species to Brad. 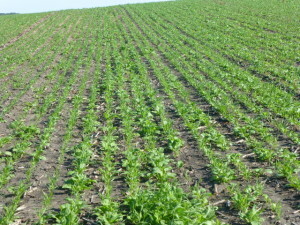 This field was planted 10 days before the photo was taken. In some later July (and soon to be mid-August) planted fields we chose to use Spring Barley and Crimson Clover along with PileDriver Radishes and Appin Turnips. TJ and Brad requested this mix so we’d get later fall growth, deeper penetration through compacted soils (Radish vs. Pasja/Vivant) and excellent N production from the Crimson clover. Spring Barley was available and many folks in Kentucky have told me that barley makes the soil “sweet” (whatever that means). From experience I know that soil after Barley is quite mellow. Take a look at my You Tube channel “covercropdave” to watch an interview I have with Brad and TJ. This beautiful stand of cover crops was planted July 2, 2013 at Brad’s dad’s place not far from the hog barns. If you sniff this photo real hard you can smell the hogs! 2 Responses to Cover Crops to the Rescue! Have been air seeding some cover-crop for 3 years in late august. As you might guess the weather did not help to get it off to an early start. 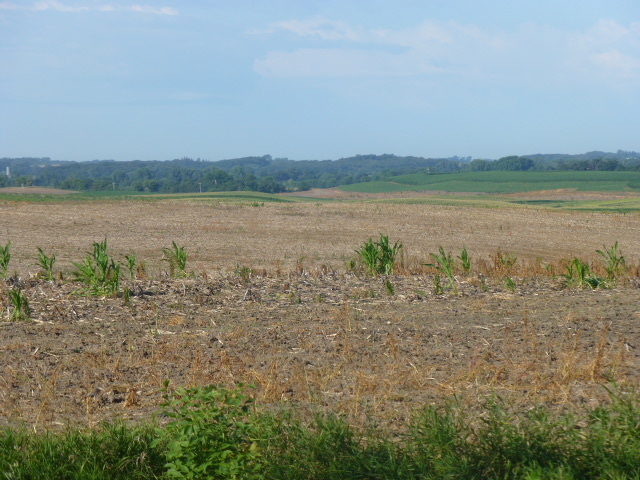 Have been thinking that to get a good cover-crop, that sowing it about when the corn is waist high would be needed. I know crop insurance is and issue. 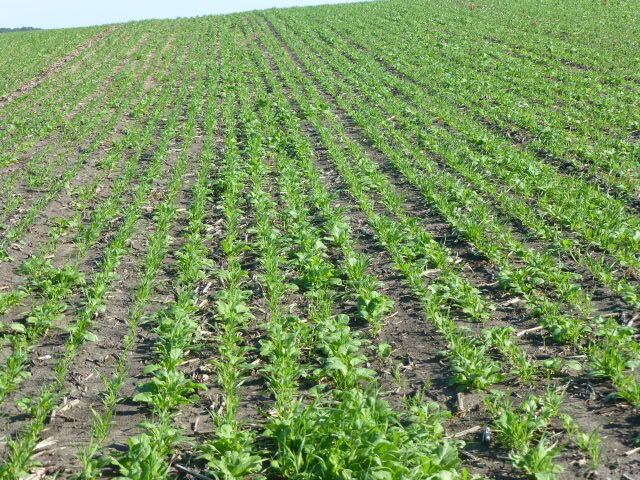 Are there some seeds that would work to start growing, remain small and resume active growth when the corn or even maybe soybeans are removed? That is a $64,000 question. My friend Woody from Ontario is working on this practice with different species with the help of Anne Verhallen, Soil Management Specialist (Horticultural Crops), Ontario Ministry of Agriculture, Food and Rural Affairs. I know that Woody had some success some years with radish, turnips, and also annual ryegrass. I also know that a few years ago when the corn was very short that crimson clover worked here in NE Indiana after seeding at “lay-by”. However, I also know that there are years when no species has worked at all. I believe there is plenty left to learn in this area! I also know that aerial application in your region has worked very well the past few years when applied closer to harvest time on corn and beans.